With the growing use of intermittent energy sources in power grids, there is a growing mismatch between when energy is produced and when it is consumed. This has led to the need of energy storage or demand-response systems in order to use the energy in a balanced and efficient way. Given this context, the Micro Energy Storage in Buildings (MESB) project parameterized and assessed the feasibility of small-scale energy storage in buildings. In the first phase, several technologies were analyzed such as compressed air, electrochemical batteries and pumped-hydro. In the second phase, case studies were presented with the goal to develop, install and test specific energy storage systems in a third phase. This project is innovative as small-scale energy storage in buildings has not been properly studied before and information is scarcely available. The project was funded by the Brussels Retrofit XL program only for its first two phases which are presented here. The third phase continued with external funding. Five energy storage solutions have been studied: Compressed air energy storage (CAES), pumped hydro energy storage (PHES), electrochemical batteries, hydrogen and thermal storage. The CAES system stores energy as compressed air. When energy is needed, this compressed air is expanded through a turbine connected to a generator producing electricity (Figure 1). Detailed information, such as cost, mass and efficiency, is given for each component, allowing a more precise design of the final system (Figure 2). Figure 2 – Investment cost for a compressed air energy system considering the costs for the compressed air tank, the air compressor and the heat storage system. Values are depicted for 4 working pressures (50 to 325 bar) and 2 power-to-energy ratios (4h to 10h system). The PHES system stores energy by pumping water from a lower reservoir to a higher reservoir. When energy is needed, the water flows from the higher reservoir to the lower reservoir through a turbine connected to a generator producing electricity. Two types of electrochemical batteries were analyzed: lead-acid and lithium-ion. It was considered the use of the battery itself and the required electronic controller. Results for the cost of lead-acid batteries are presented in Figure 3. Figure 3 – Cost per energy stored as a function of the battery’s energy capacity for sealed and unsealed lead-acid batteries. Hydrogen has been announced for a long time as the energy carrier of the future. In this project it was considered the production of hydrogen from water electrolysis. This hydrogen would be stored and later used in a fuel cell. Each of these components was detailed and, as an example, results for fuel cells are presented in Figure 4. Figure 4 – Mass and volume of hydrogen fuel cells. It was also considered the use of hot water for energy storage. The goal is to use this energy for thermal purposes, not for electricity recovery. Insulated water tanks are an old and widely spread technology. Some characteristics for these five systems are assembled in Figure 5. Figure 5 – Capital cost, mass and volume of energy storage technologies. From the results obtained, thermal storage reveals to be the best choice when the energy will be used for thermal purposes. For electricity storage, compressed air presents the lowest costs but given the lack of maturity of this technology, there is a low confidence in the results obtained. Ignoring compressed air, the most suitable technology for electricity storage is lithium-ion batteries. In the second year, 5 case studies were analyzed using the previous parametrization: a small residence, the Mandela student residence, the ULB Solbosch campus, building D from ULB Solbosch campus and a city block. 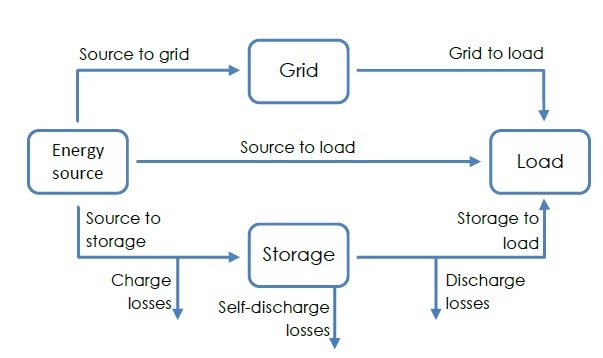 Data for the electricity consumption of each case study was obtained and a model (Figure 6) was developed to simulate and optimize the installation of photovoltaics together with an energy storage system. Figure 6 – Developed model for simulation. The storage and PV capacity were optimized for the lowest Levelized Cost Of Energy (LCOE) for different values of solar fraction (fraction of the percentage of electricity load supplied by local photovoltaics electricity production). 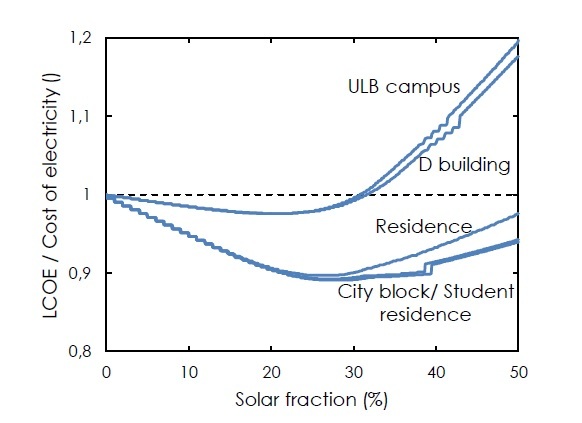 As an example, results for the Solbosch campus are depicted in Figure 7. Figure 7 – Minimum LCOE for different power configurations. LCOE starts at 12c€/kWh which is the current average price that ULB pays for electricity. The minimum LCOE decreases with the installation of photovoltaics up to a value of 25% of solar fraction. From this point on, the excess of local electricity production which is sold to the grid at a loss becomes too important, increasing the LCOE. From this point on though, the installation of an energy storage system can reduce this effect. The best case is found for a combination of PV and a Li-ion energy storage system. This observation stands true for all the case studies (Figure 8) being the cost of electricity a determining factor on the results obtained. The higher the electricity price, the higher is the solar fraction achieavable with a local PV intallation coupled to a Li-ion storage system. For buildings paying a tariff over 20c€/kWh, a solar fraction higher than 50% is achieavable at a lower cost (LCOE). 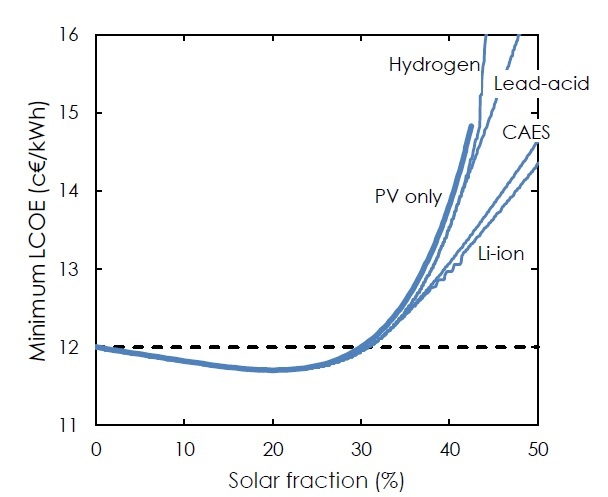 Figure 8 – Ratio LCOE/ cost of electricity according to the solar fraction for the best configuration of the five case studies. The best configuration for the lowest cost (LCOE) also remains more or less the same for all the case studies. Up to 30% of solar fraction, a PV-only installation presents the lowest cost. For higher values of solar fraction a PV system coupled to a Li-ion storage system presents the lowest cost. 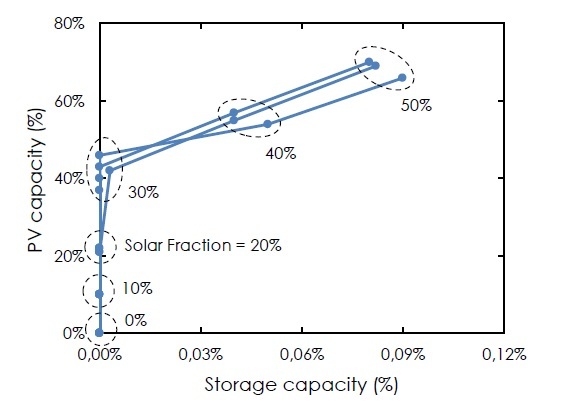 Figure 9 – Best configuration in terms of PV and storage capacity for a given solar fraction for the five case studies. Only cases with LCOE inferior to the actual price of electricity were depicted. The project will continue with the installation of storage systems in buildings equipped with PV to validate the results obtained.